Distinguished international architect and London South Bank University (LSBU) alumnus David Adjaye is to become Sir David Adjaye after being awarded a Knighthood for services to architecture in the Queen’s New Year Honours list 2017. Professor Jacqueline Dunkley-Bent - OBE, Visiting Professor of Midwifery. David said: "I see this not as a personal celebration, but as a celebration of the vast potential – and responsibility – for architecture to effect positive social change, that we as architects have to bring something positive to the world. “I am proud to continue to work in service of this mission as a global cultural ambassador for the UK." Local London landmarks designed by David include the Stephen Lawrence Centre, which aims to encourage disadvantaged young people to pursue careers in architecture and urban design. He collaborated with David Chipperfield on designs for the flagship Idea Store in Whitechapel, in the heart of London’s East End, and helped transform an old timber factory in Shoreditch into the minimalist 'Dirty House' - home to artists Tim Noble and Sue Webster. David’s high profile international projects include the Moscow School of Management in Russia, Smithsonian National Museum of African American History and Culture in Washington DC, USA, Museum of Contemporary Art in Denver, USA, and the Nobel Peace Centre in Oslo, Norway. 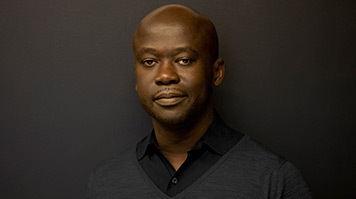 His firm, Adjaye Associates, is currently involved in plans for a major new art museum in the Latvian capital, Riga, and a children's cancer treatment centre in Rwanda.